If someone you love is suffering from an eating disorder, whether that’s anorexia nervosa, bulimia, or any other type, it can be really hard to cope with and know what exactly to do. You know that you need to support them but the situation is no doubt delicate and needs to be handled in a sensitive but practical way. 1. Educate yourself about the eating disorder your loved one is suffering from. Increased understanding about their symptoms, treatment and course of illness will enhance your ability to provide appropriate support for them. 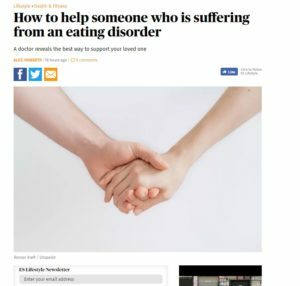 Your knowledge will help you reason with them about any inaccurate ideas that may be fuelling their disordered eating. 2. Encourage them to seek professional treatment for their symptoms. If you notice your loved one has problems with eating normally, is losing weight or you suspect they may be bingeing and purging, gently suggest they seek help. Have the conversation at a time and place when you are able to have a calm conversation with them. As with most conditions, treatment is usually more effective if started early on. If you are worried about the state of health of a loved one with a suspected eating disorder who is refusing to seek help, talk to a doctor or therapist about your concerns to find out what you or they might be able to do. In severe situations, the law can be used to deliver life-saving treatments for eating disorders. 3. Be loving, patient and sympathetic with them and try not to be critical even if you disagree with what they may or may not be eating or doing. People with eating disorders are frequently in denial and can become very rigid in their behaviours and thoughts but it is best to leave management and advice to their professional team. Try to not get angry in response. Such disorders are quite complex to treat (because the surface level symptoms often cover deep emotional damage) and if it were that easy for them to eat normally, they would have been able to have done so by themselves. There may be times when you feel you have to set strict boundaries such as medical monitoring and other times when you have to step back and let your loved one take more responsibility for their own welfare. Try and adopt a caring yet firm approach. 4. Avoid commenting on their appearance or weight as they are likely to be already very self-focussed about their body. Suggest they discuss concerns about these attributes with their professional team and try and encourage them to express their emotions instead eg Why are they obsessed with losing weight and what do they think they will achieve by doing so? Also, be mindful of the way in which you talk about weight and size yourself. 5. Try not to constantly monitor their eating. Ask your loved one how or if they would like you to be involved and let them know you are there for them if they want to talk about their feelings. Respect them if they decline to chat but gently encourage expression of emotions with their therapist. 6 .Seek support for yourself. Seeing a loved one affected by disordered eating can be extremely distressing and create considerable tension in your relationship with them. It can be very frustrating and leave you feeling helpless. Find out about local support groups for relatives and friends of those with eating disorders that you could join. Sharing experiences can be very helpful in making you realise that you and your loved one aren’t alone in your experiences and you are likely to learn from individual experiences of coping.